Game is DRM-free and natively portable due to one-size-fits-all installation size. Massive selection of free tracks and trucks from community sites. Issues using Direct3D renderer under modern operating systems. MTM2.com for a database of Monster Truck 2 tracks, trucks, and fan sites. Add lines to the end of the file that includes the paths to two files installed with Monster Truck Madness: game.pod and truck.pod (files located in the System folder where you installed Monster Truck Madness, or in the System folder on the Monster Truck Madness disc). Change the number at the top of the file to reflect the total number of pods listed (i.e., if you added game.pod and truck.pod to the list, change the number at the top of the file from 19 to 21). Start Monster Truck Madness 2 and navigate to the Races screen. The Monster Truck Madness classic circuit and rally tracks are included in the Track list (they're listed after the Monster Truck Madness 2 tracks and Summit Rumbles). 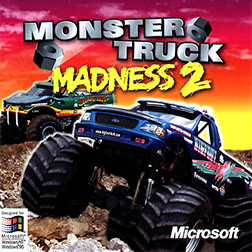 Monster Truck Madness 2 can be run in Windows 10 and even in 64-bit. There's a few tweaks that are required in order to make this game made in 1999 work on new hardware. Boot your PC in Safe Mode. Easiest way is to go to your Start menu, click the power icon as if you're shutting down, but instead of clicking Shut Down, hold SHIFT on your keyboard and click Restart. From there, navigate to rebooting into Safe Mode. From Safe Mode, press Windows + X or open the Control Panel and look for "Turn Windows features on or off"
Look for "Legacy Components" and tick "Direct Play"
Install the game as usual. If you can't install the game, run the installer as an admin with compatibility mode set to Windows XP SP3 then it will work. After installing, right click on the game's icon and go to Properties. Under the tab labelled Compatibility, check the box next to "Run this program in compatibility mode for" and select Windows XP (service pack 3). Also check the box labelled "Run this program as an administrator". Install the official MTM2 patch (made by developers of the game). After that, download the Community Patch and extract it into MTM2's game folder (usually C:\Program Files x86\Microsoft Games), overwriting files when prompted. The community patch fixed issues and enables high resolutions. Install nGlide. You don't need to change any settings in nGlide. This allows the game to be rendered using 3Dfx, which makes it look much better. Use a software to cap the frame rate at 30 FPS (see Frame rate capping). Limiting the FPS to 30 fixes problems in the game like the AI trucks not knowing how to drive. 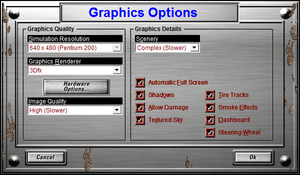 In MTM2, go to the Options > Graphics and then change the renderer to 3Dfx. Click OK and restart MTM2. 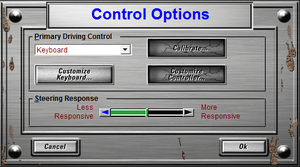 In MTM2 go to Options > Graphics and change your resolution to whatever your screen resolution is (such as 1920x1080). Under Graphics > Hardware Options, don't enable reflections or truck reflections but everything else can be enabled and turn up to the max. Also under Graphics, uncheck the box "Automatic fullscreen" and don't enter fullscreen mode or the game will crash. 4:3 resolutions only; use nGlide for higher 4:3 resolutions. Can be forced in your GPU's control panel when using Direct3D or Glide renderers. Replace antialiasFlag=0 with antialiasFlag=1 in <path-to-game>\Monster.INI. Playing without the game CD forces each race track to use a single, unique music track. Uses MSN Gaming Zone (no longer available). Check every checkbox except for "Run in 256 colors". Fix tends to be unreliable and only prolongs the time until a crash to the desktop occurs while racing. Forces game to start windowed if intro movies are played. Glide renderer can be used as a much more reliable substitute. Run Monster Truck Madness 2. Click on the "Game" menu from the top menu bar. 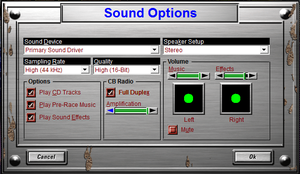 Click on "Graphics" from the drop-down menu which appears. 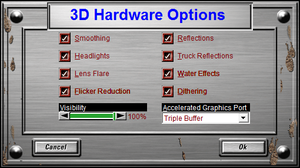 From the list of renderers, select 3Dfx. If prompted regarding potentially-incompatible settings, click OK and restart the game. Fix is far more reliable than setting compatibility options. Gilde renderer has noticeably-muddier textures than Direct3D renderer. MSN Gaming Zone Shut down as of June 16, 2006. This page was last edited on 21 March 2019, at 03:08.